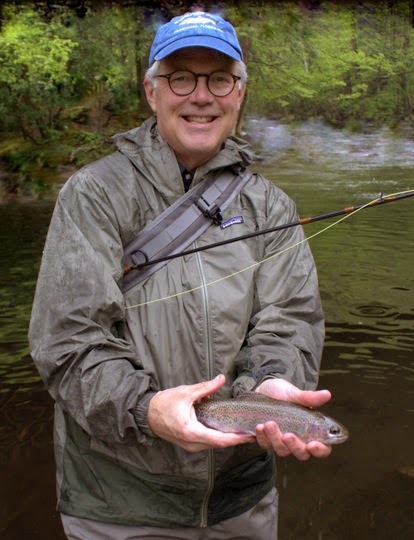 Today, while out guiding, I had an experience that reinforced the importance of really paying attention to what is going on while you are out on the water if you want to be successful fly fishing. We were fishing Little River through some fantastic mayfly weather. You know the type: cloudy, cool, and wet at times. With rain gear on we were staying pretty dry, but as might be expected the bugs were struggling to get off of the water which meant that the trout were feasting heavily. When we first got to the edge of the water, I knotted on a #16 Sulfur Parachute. With a few sulfurs on the water, that seemed like an obvious choice. Within a couple of casts the first fish ate and was quickly landed and released. We then moved up just a little in the pool to cast to more risers. A few fish hit but somehow missed the hook, and after another 10 minutes we realized that the number of strikes had dwindled even though the fish were still eating something. Putting my face down to the water didn't help much other than to confirm there were microscopic midges, but I was convinced the fish weren't eating those for the most part. The takes were too boisterous. Squinting a little, I saw some little bugs. Blue-winged olives were hatching. Using the larger sulfur to help find the little bug seemed like a smart strategy so I added 6x tippet to the bend of the hook on the #16 and added a tiny #20 Parachute BWO dry fly. Immediately we were back in business. This went on for several fish and culminated in the largest fish of the day, a wild rainbow that easily went 12 inches which is a nice fish for the Park. Jack with a beautiful wild rainbow. However, shortly after the big rainbow, the hits became few and far between again. 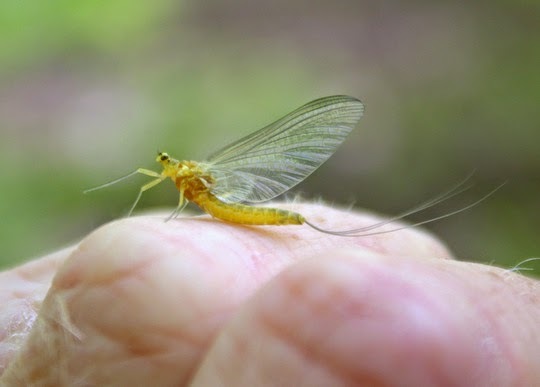 We moved to another pool and again quickly caught a fish on the combo rig we had been fishing, but after several refusals on both the BWO and the sulfur, it was clear that we needed to make a change. The fish were rising vigorously and it was apparent why when we simply glanced around. Big yellow pale evening duns were hatching, and because of the rain were having a hard time getting airborne. A quick adjustment had us back in fish in a short time that culminated in a healthy 10-11 inch brown as the last fish of the day. However, this story would have been over by the end of the second paragraph above if we had not made adjustments. Instead, we figured out what the fish wanted and played the game. If you are seeing fish rising but getting refusals, take time to sit back and watch. This is where a guide can really help since they can focus on figuring out what the fish are eating while you focus on watching your flies. If you do not want to hire a guide, then just stop casting and watch the fish for a bit. Put your face down near the water, look in the air around you. Eventually something will click and you will pull out the right fly and be into fish again. Don't stick with a fly just because it worked last time. Every fish is a new puzzle and that is one of the things that makes this sport beautiful. If it was too easy we would all give up soon. Good advise. When dry flies and hatches are the name of the game I sometimes spend three or four times more time observing than casting. It often pays off in a big way. That pays off a lot of the time for me as well, even in the cold months when nothing is happening. Mark, I'm hoping that the great fishing will still be going on when you visit! Bill, glad the strategy is working out for you as well! I'll get back to you on those flies shortly. Nice post David. I'm going to try and pay a little more attention when I get to the water. It really does make a big difference in my opinion Howard. I have a bad habit of getting impatient though and just wanting to fish. That is one thing good about guiding: I'm spending a LOT more time observing and often notice things I otherwise may have missed.